The report from The Lancet Commission on Pollution and Health includes short, medium and long-term solutions. Below are highlights of 12 key strategies for countries and cities to reduce pollution and save lives. Examine where the largest impacts from pollution occur, and prioritize projects to implement. Resources are always scarce, and work should be undertaken to determine the most impactful and potentially successful projects. Base prioritization on health impact, economic benefit, and other key metrics. 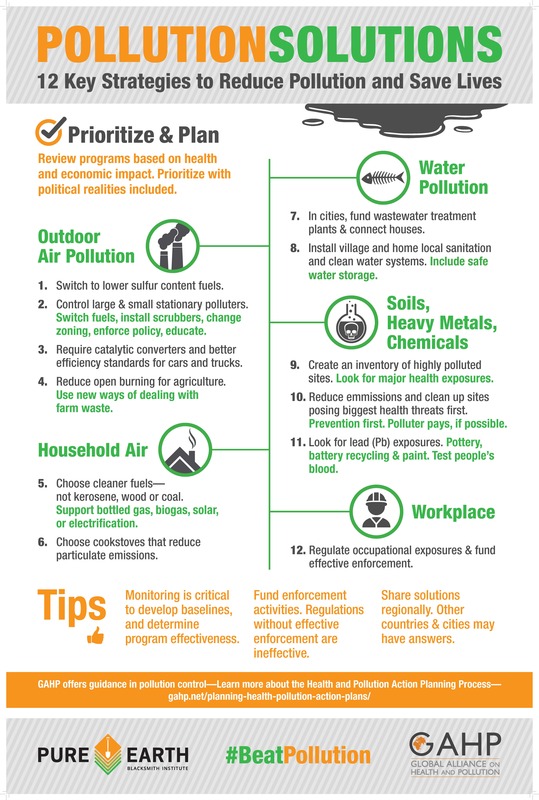 Use Health and Pollution Action Plan tools or equivalent. Source apportionment studies are often needed to determine the sources of toxicants. 1. Switch to lower sulfur contents fuels – autos, trucks, and heating. Use euro 6 fuel standards. Deal with smoke belchers. This needs solid policy and enforcement. 4. Change practices with regard to burning of biomass and solid waste. 5. Bring in cleaner fuels, (not kerosene) and phase out wood and coal. Support bottled gas, biogas, solar, electrification, etc. Ones that reduce particulate emissions. 8. Install village and home local sanitation and clean water. 10. Clean up most toxic sites. Prevention always first! Polluter pays, if possible. Monitoring is critical – to develop baselines, determine program effectiveness, and provide public information. Enforcement of regulations is critical and needs funding. No regulations should be created without an effective enforcement program design and implementation. Research activities will be required to support these solutions. Public and political support, and enthusiasm is needed. Programs should have a communications component.